Previously running on HomePod version 11.2.5, the update brings the HomePod's software to the same numerical version as both releases to tvOS and iOS. Since its availability in February, the device has not needed to receive an update, but Apple did include a mechanism to update the software from launch. The update, bearing build number 15E217, weighs in at 2.36 gigabytes, but it is unclear what changes are made or new features are being added, if any. The release notes briefly state it includes "general improvements for stability and quality." 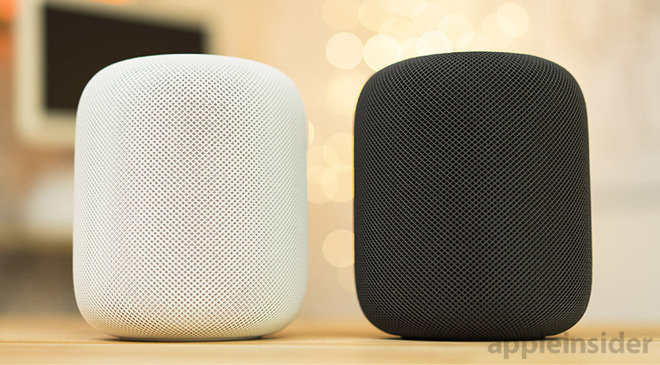 One of the changes expected to arrive is AirPlay 2, but the lack of the updated communications protocol in iOS 11.3 puts its existence on HomePod in doubt. AirPlay 2's main improvement is support for streaming audio to multiple devices simultaneously, such as HomePods and Apple TVs, as well as incorporating AirPlay 2-supporting speakers into HomeKit. AirPlay 2 did make an appearance in the first two iOS 11.3 betas, but subsequently disappeared for reasons unknown. The HomePod is capable of performing updates automatically, but it is also possible to manually trigger it to go through the update process. After updating an iOS device to 11.3, users need to enter the Home app, tap the location icon in the top left, then tap Software Update. Selecting the following Install button will install the update on all HomePod speakers set up on the network at the same time.